Make the complex simple with Ebury Fusion. Our comprehensive solution combines expert consultancy, risk management and managed services with our intelligent Payment Factory to drive efficiency in your business’ international payments and collections. For larger businesses with complex international payment and currency risk management requirements, Ebury Fusion ensures you get the right solution for your business. We’re already supporting clients in the technology, shipping, non-profit and trust management sectors as well as many large importers and exporters. Consolidate your payment and collection processes with Ebury, a managed service provider, to save on operational expenses and processing fees. Ebury Fusion can grow with your business. In fact, we’re one of the largest providers of integrated, automated payments, so have the expertise and experience to support your growth. Our solution integrates into your systems and ensures your payments are delivered against your business risk management policy, giving you control. From as little as a day to onboard for simple payments, to a matter of a few weeks to implement complex payment processes, you will be up and running in no time. Expert Consultation: Your business is unique, so whether you’re wanting to outsource the management of your payments and reconciliation, protect margins from currency volatility or increase efficiency and speed in your payment processing, we’ll ensure Ebury Fusion is tailored to your needs. Our experts will collaborate with you to understand your business strategy, ambitions and pain points so they can create the right payment and collections processes and risk management strategy for you. Intelligent Payment Factory: The innovative technology and infrastructure powering the Payment Factory allows you to consolidate and streamline your payment processes, creating cost effective operational efficiencies. With third party collection accounts, payment authorisation permissions and access to over 140 currencies at competitive rates, Ebury Fusion gives you the ability to quickly and automatically collect funds from suppliers, clients and subsidiaries and securely pay multiple parties across the globe. Managed Service: We know the management of your international payments and collections can be a time consuming, operational burden. So, as part of our Ebury Fusion solution we can provide a managed service dedicated to the operational support of your end to end payment processing. We can manage payment queries on your behalf, support your usage of our online platform, process and check payment files and work with your subsidiaries to fund your accounts on time. We ensure you, your clients, suppliers, and subsidiaries get a seamless experience. 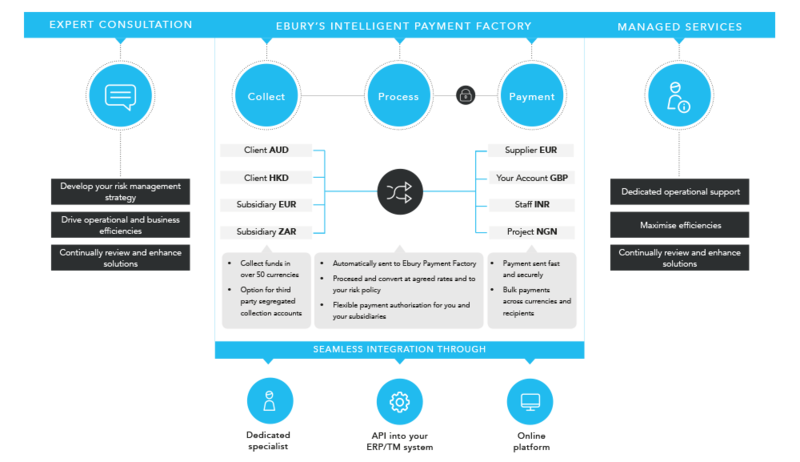 Integration of our payment technology into your ERP or treasury management systems via our API; use Ebury Online, our proprietary front end account management platform to manage your transactions or transact through your dedicated Ebury account manager.